Summary: A good credit-based insurance score can lead to lower premiums; and improving your credit score can improve your credit-based insurance score. You probably already know that having a bad credit score could make it difficult to get a loan or a credit card, especially with a favorable interest rate. But that’s not the only way bad credit can impact your wallet. According to FICO, 95% of auto insurance companies and 85% of homeowners insurance companies use your credit information to help determine your monthly premium. “There is a high correlation between poor credit and higher claims costs,” says David Miller, a vice president at insurance brokerage Plexus Groupe. “So, those with low scores will pay more for coverage. As a result, it’s important to understand how credit-based insurance scores work and what you can do to improve yours. A credit-based insurance score is similar to a FICO or VantageScore credit score, in that it’s a numerical representation of your credit information. The difference is that your insurance score may not be based on your full credit history like a typical credit score is, and it may give certain factors more or less weight. Your credit-based insurance score has nothing to do with your C.L.U.E. (Comprehensive Loss Underwriting Exchange) reports, which show a seven-year history of claims on your current and past homeowners or car insurance policies. Also, applying for insurance or getting a quote won’t impact your score at all. That said, insurers will likely also consider your C.L.U.E. report when determining insurance rates. 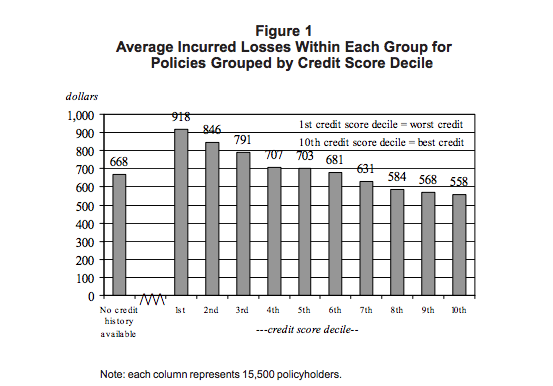 Credit-based insurance scores were first introduced by FICO in 1993. But insurance companies didn’t start using them en masse until the last decade or so. This is because of two studies, one from the University of Texas and one from the Federal Trade Commission, that showed that the scores are useful predictors of risk. For example, the University of Texas study found that the average insurance claim for people at the lowest end of the credit spectrum was $918, while the average claim for people on the highest end was just $558. And in general, losses decreased as customers’ credit scores improved. The graph below is from the University of Texas report. While credit-based insurance scores are now widely used for auto and homeowners insurance, doing so isn’t legal in every state. California, Hawaii, and Massachusetts have all banned the practice, requiring insurance companies to rely solely on other factors to determine rates. In other states, however, it’s fair game. There are two different credit-based insurance scores that insurers use: the LexisNexis Attract Score and the FICO Insurance Score. Here’s what to know about each. Insurance companies don’t provide hard data on how much more you’d pay with a poor insurance score. However, states generally don’t allow insurance companies to use your score as the sole reason for raising your rate, denying your application, or canceling your policy. So, as long as you have a spotless driving record and no claims with your previous insurance companies, you may not see any negative impact to your monthly premium. In fact, 75% of insurers claim that their policyholders pay lower premiums because of their use of credit-based insurance scores. In other words, having a good credit score can help lower your premiums because the insurance company knows you’re not a risk. If, however, you have a low insurance score and problems in other areas, it could cause your rates to go up. Unlike your regular credit score, your homeowners or auto insurance score isn’t readily available for you to check to see where you stand. But since your insurance score is based on your credit history, improving that history will help boost your insurance score over time. 1. Check your credit score and report If your credit is already in good shape, you likely don’t have much work to do. But you won’t know for sure until you know what your score is. If you have a credit card, your financial institution may offer free access to your FICO credit score. If not, use a service like Discover Credit Scorecard to check your score now and while you work on improving it. Also, get a copy of at least one of your credit reports to see if there’s anything you need to address, such as a delinquent account or inaccurate information. You can get a free copy of your report from each of the three credit bureaus once a year at AnnualCreditReport.com. With both your score and your credit report, it’ll be easier to know exactly what your next steps will be. 2. Maintain a spotless payment history Your payment history is generally the most important factor in all of your credit scores. As a result, it’s essential that you make sure you make all of your payments on time. If you have a late payment or delinquent account on your credit report, work to get it paid off as quickly as possible. While that negative mark will stay on your report for seven years, its impact will diminish over time, especially if your most recent payment history is perfect. 3. Pay down your credit card debt Whether or not you carry a balance from month to month, having a high balance on your credit card could be hurting your credit scores. Work on paying down your credit card balance as quickly as possible. Then going forward, try to keep your credit utilization — your balance divided by your credit limit — as low as possible by making multiple payments per month or using the card less frequently. 4. Avoid frequent credit applications Every time you apply for credit, the hard inquiry on your credit report can knock a few points off your credit score. If you apply for multiple loans or credit cards in a short period, it can signal to lenders and insurance companies that you rely too much on credit. As such, avoid unnecessary borrowing, at least until your credit scores are in a better position. 5. Give it some time Even if you start making all the right decisions today, you won’t see improvements overnight. Building credit can take time because lenders and insurers want to make sure you can sustain your good credit behavior over the long run. So, as you work to improve your credit game, prepare for a marathon rather than a sprint. 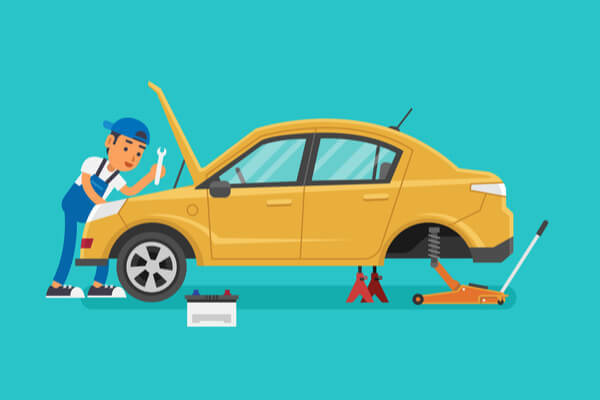 While it’s possible that your credit-based insurance score can increase your monthly auto and homeowners insurance premiums, it’s also likely that they’ll help you instead. So, if the other benefits of establishing a solid credit history aren’t enough, consider that you could be saving money in even more areas by improving your scores. Ben Luthi is a personal finance writer who has a degree in finance and was previously a staff writer for NerdWallet and Student Loan Hero.